This statement may be controversial, but I hate fried rice. I’m sure in part it’s because my stomach is sensitive to grease and onions, but fried rice also has an unappealing, burnt greasy taste, even when done “well”. When I first found a spell for fried rice, I just kept going, completely uninterested. But then another mage told me how I HAD to try toasted sesame oil, and how it was going to be the ingredient I didn’t know I was missing. Well, it was enough to make me start experimenting. I found a method for making baked fried rice on OhMyVeggies, and have really loved it, but have made a few changes that really bring it home. Best of all, it was a place to test the “toasted sesame oil is the greatest level 9 spell you will ever learn” hypothesis. After trying it in this dish, I am wholly in agreement. Now, toasted sesame oil is as crucial to my stash as soy or garlic. It’s that missing ingredient in stir fries and other dishes. It’s got that flavor that you couldn’t quite put your finger on, but was always the difference between what you would make and good takeout. This is a great way to use leftover rice. It’s surprisingly high in protein and fiber for how satisfyingly junk-food-like it is, and, while a little involved, it’s an easy recipe to put together! It will make a believer out of any pesky Muggle, and will make you understand that after moving nearly a thousand miles across the country, one of the first questions we had to answer was “where do we get our toasted sesame oil?” Closer to teppanyaki style fried rice than wok-fried, but it’s also much easier to get right, and much lower pressure! 3-4 cups leftover (preferably a few days old) cooked rice, brown or white- if using 4 cups, opt for the larger amounts of the liquid ingredients! Grease a cookie sheet (with edges, this is quite important!) and preheat the oven to 350 degrees. Combine Braggs, toasted sesame oil, and sriracha in a large bowl, stir well. 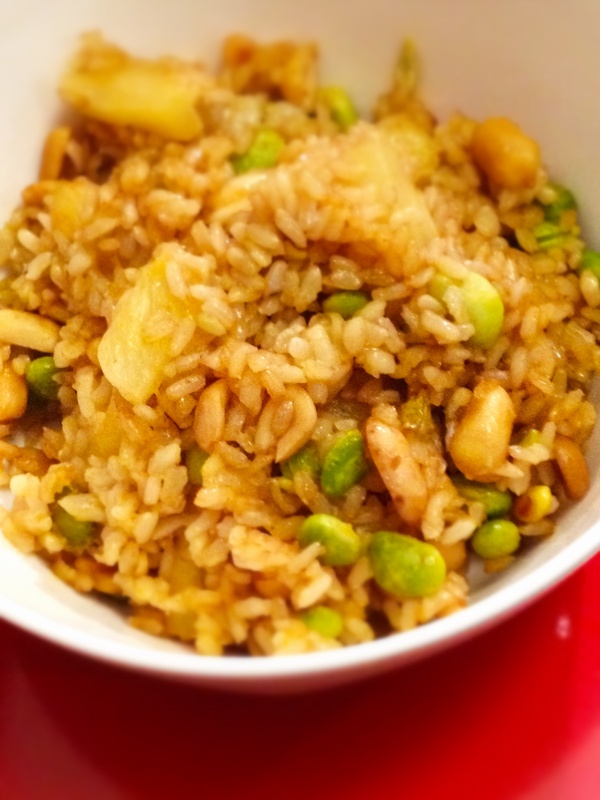 Add rice, edamame, peanuts and pineapple, and stir to coat completely. Adjust if it needs a little more oil or soy to cover everything! Bake for a total of 45 minutes, but remove from oven every 15 minutes and stir entire mixture around the baking sheet, shifting things from edges to the inside and vice-versa. Rice, peanuts, and edamame will show browning when it’s done! This entry was posted in comfort food, powerful & potent, simple and satisfying and tagged comfort food, dinner, DIY, easy, healthy-ish, homemade, junk food, lunch, rice, spicy, vegan. Bookmark the permalink.